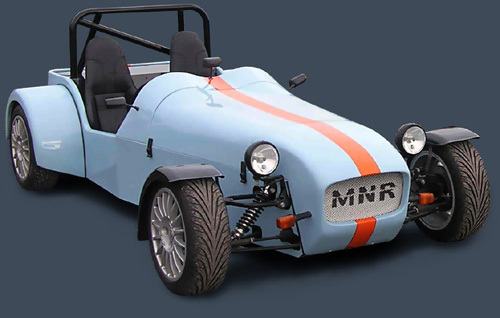 Welcome to our kit car build diary for the MNR Vortx R1 from the very beginning, making the right kit car purchase to the current state of the project. After our SVA fail in Mitcham we have a few problems to sort out. First job was to replace a wheel bolt that when checked as part of our SVA test was buggered along with one other. The thread nuts thread was mangled and were still unsure why but it was a quick and easy fix - cleaning the stud threads then fitting a new nut. The bumper bar was completely unsuccessful so we have now mounted the indicator on shorter stalks from the headlight bar where they are fully visible. 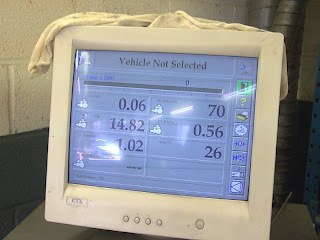 The bias bar needed locking which we didnt want to do before the test as we were unsure where the correct point to lock was having not tested the braking system. Turns out it was fine where it was so we drilled the accesible clevis straight through the bias bar on the left and fitted a roll pin. This sufficiently locks the bar so it cannot be twisted but I've heard some examiners may ask for both ends to be locked. As the right clevis is not easily drilled we fitted a washer and nyloc nut then drilled straight through the nut and fitted another roll pin. In the picture above you can also see the painted metal seat brackets as required by the tester, these 8, 100mm x 100mm x 4mm plates will spread the weight evenly on all 8 seat bolts so that in the case of an accident the floor is strong enough not to collapse. They are on the floor underside on the rear seat bolts and on the inside floor on the front of the seats. My good mate Dan and his dad Paul at PD Motors are letting us use his MOT emissions tester to get hit the magic figures to pass at SVA. It started out by going quite well adjusting the fueling to reduce CO2 at idle. Hydrocarbons were off the scale though and at fast idle everything was a massive failure like in the test. Paul adjusted the TPS to reduce the voltage at 0% from 0.76 to 0.61. It helped a little but after this the exhaust was running so hot it melted the regulation tester. At this point we stopped although we had achieved better figures we had our doubts about our catalytic converter which was sourced off ebay. For the time being thats it and were no closer to passing if this issue isnt resolved. Back to stage one again - maybe the cat is useless so our first stage is trying it without the cat fitted to see the engines base emission. With a bit more time on our hands we made the short journey down to detling kit car show. We needed a few bits plus its always nice to have a look over manufacturer and owners cars. We aspired to build a car as good as some of those we saw at the same show last year. Looking over the cars were really glad we chose the MNR over the Tiger which we very almost bought if you remember reading over a year and half ago! There is quite a difference between the fit and finish of both cars and the quality of the parts supplied is much in favour of the MNR. Although our car is not perfect and a little rough around the edges we were both really pleased to think when we saw alot of the cars there ours was better which really makes you feel good when you've put so many hours into a project. 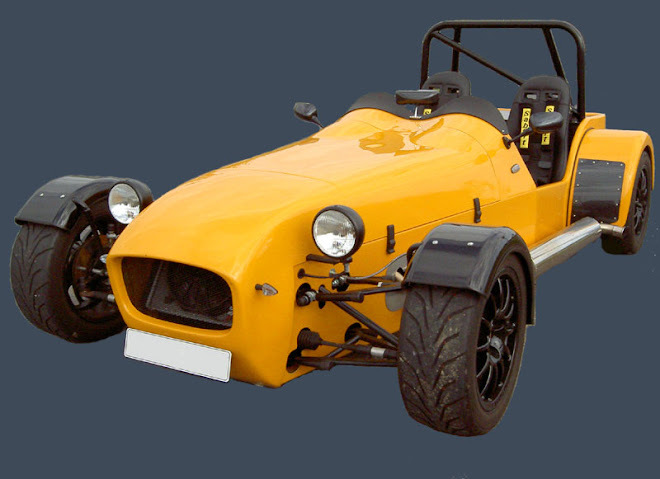 I really do like this chaps Caterham Seven as the colour combo is wicked and for quality its top notch but i cant help but think it looks a tad dated with some of the interior/exterior fittings and pound for pound doesnt have anything on our MNR. A great looking Avon from the manufacturer Tiger whom we almost bought a Six kit from. This stood out for me with its tidy look, dark grey body work which is quite unusual and sporting a rear diffuser which is pretty rare. I know MNR have been developing one which id like to get my hands on as it looks cool and should offer some high speed stability and down force. The only MNR Vortx we saw today with a similar spec which was nice and good to have a little nosey around. 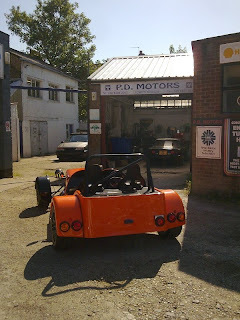 We turned up bright and early at PD Motors and got the car into the MOT bay. 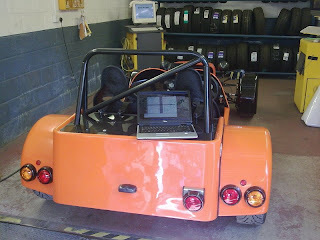 Paul sounded pretty sceptical at first having found no useful information to get it through testing, as bike engined cars and there emissions are quite a specialised area as bike emissions have near no testing but cars when fitted in the car they do. Here are the figures we had to beat from the sva test; C02 around 3.0 - 4.0, hydrocarbons 250-300 and lambda 0.88. After some fine tuning moving fueling from -20 to -24 the figures were all up from last time on natural idle but fast idle was really off. This left us thinking that either the changes we had made had positive impact or the cat was the original problem having got it off ebay. Paul was sceptical on whether the cat would be big enough to reduce the figures enough so i was starting to give up on getting it sorted today. Dad decided to get the cat on just to see if it made any difference. We warmed the cat up with a nice rich standard map and as soon as the probe was in the figures were almost on 0 for everything other than lamda which held steady at 1.14 to decrease the lambda we richened the mixture from -25 to -23 and after the map was uploaded the lambda crept down until it hit 1.02. Result! although I had to look at the figures 2 or 3 times as frankly i couldnt believe the readings. Dad was pretty chuffed and i was just gobsmacked so we thanked Paul for the use of the kit and packed up leaving everything as it was. Only thing now is to fit the MNR loan steering wheel to bypass this collapsible boss issue. We received it the week before the test and its just what we have currently with a plastic pad not exactly a collapsible boss but every other MNR has passed its SVA and now some even there IVA tests without a problem so hopefully we wont have any trouble. 6 - speed sequential paddle shift, Sierra 3.38 standard diff and push in driveshafts, Custom balanced propshaft. Round tubing 16 and 18 gauge fully powder coated black, RAC MSA roll bar. MNR fabricated Cortina Uprights, Inboard Pushrods, Aluminium Hubs, Protech Dampers and Springs, double wishbones with rose joints, Fully polybushed. Sierra Hubs with Protech Dampers and Springs, double wishbones, Fully polybushed and rose jointed ends. Front - Cortina M16 Wilwood powerlite 4 pot calipers, wilwood performance pads and solid, drilled and grooved 265x9mm discs. Rear - Sierra calipers with handbrake cables, Ferodo pads and solid discs all with new 5.1 brake fluid, coppe pipes, cables, Goodridge braided hoses and 0.625 and 0.7 Comp Brake master cylinders. Orange body with black front wheel covers and orange rears with carbon splash guards. Carbon front lights and carbon surround circular lights. Finished with Yamaha original emblem's. Carbon fibre panels, MNR black single piece transmission cover, Black GRP race seats, 4 point Sabelt harnesses, OMP Trecento steering wheel, R1 digital clocks and Racetech mirrors, Motorsport silver push button switches with smiths gauges.